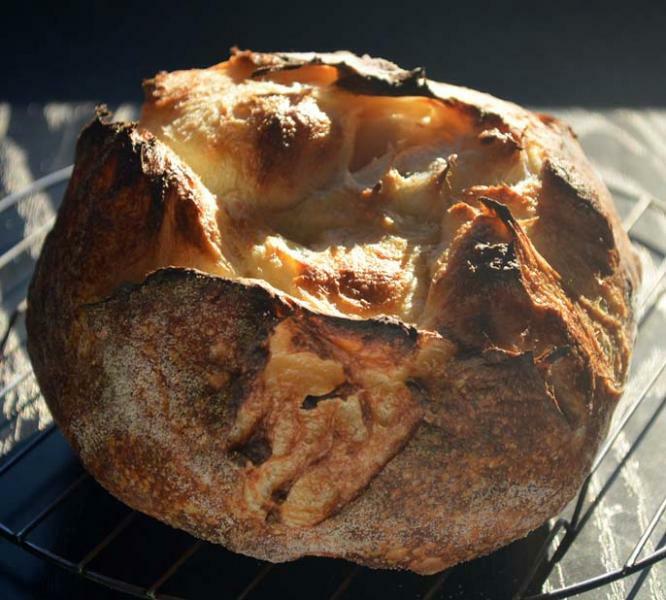 This bake was done almost exactly as the last boule bake with a couple of exceptions. I upped the hydration to 77 from 75% and compensated by autolysing for 40 minutes and proofed for 50 instead of 45 minutes. I also increased the bake time in the covered cast iron DO from 10 to 11 minutes and finished with 10, convection, turning often. Ken Forkish seems to like to push the limits on his bakes and it is fun pushing things up on my baking!I I proofed this one Forkish style, seam down and prior to baking decided to once again score a deep half moon across the seam I thought most likely to burst.in case the seams didn't open. Well, I got great spring and the seams also exploded and created perhaps the most interesting looking loaf I have ever baked. Among other things I like is Ken Forkish's bake seam side up for that 'organic' look. Well the slash opened nicely and the seams burst to create this interesting KF style 'organic' loaf! I am getting a great kick in pulling stuff like this out of my home oven! 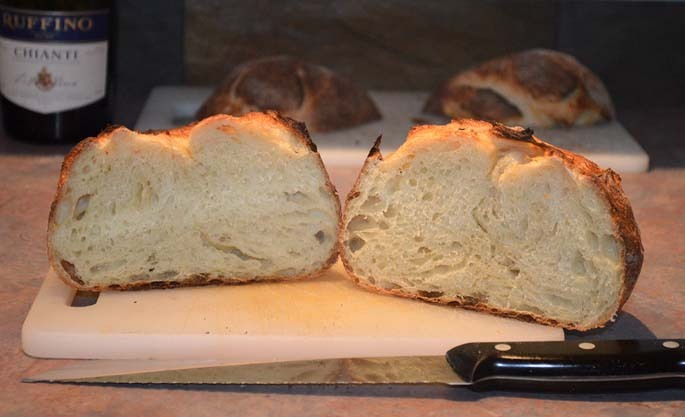 I really love the crumb, crisp crust and flavour of this bread and I have found feeding my starter daily and baking off half has improved my breads. Finding my chops . . .
What a great looking bake. I'm trying to figure out what to camera the look to...almost like a cathedral. If it tastes half as good as it looks you have a sure winner. Yeah, your seam side up results are fascinating! I'll have to give that a shot sometime soon. Just beautiful baking. Great photography too!. That first photo is a classic. I just love the bold crust on this bread - one in a million except you do it all the time!. I'm not a Forkish white bread kind of guy but 20% whole grains with some scald or sprouts and' there with ya. Well Done! The top sirloin comes off the cure tomorrow. One day to soak the salt off and a extra day to air dry in the fridge - then on the hickory smoke. I really enjoy baking Ken Forkish style! My our bread is almost a rose. It sprang and opened so wonderfully. This looks so organic and I can imagine a crunchy crumb with a buttery crumb. Thanks guys! Another tasty loaf. Well dab I thought a Forkish style loaf deserves Forkish style photography and tried to mimic his cover shot . . . In the end it is about the flavour and I like the flavour of this loaf and can't wait to try it with the YW. I thought I was looking at a bread bowl with melted cheese. You may be on to something ; ) Sure looks delicious! Bread bowl . . .
A most satisfying loaf! Well using KF's proof seam side down and bake seam side up has produced to nice looking loaves in a row. Good tasting too! Both of my last 2 bakes were also scored, with a deep crescent kind of perpendicular to the seam I thought would best open. Both loaves blumed beautifully and i like this baking technique! I think I have a working yeast water thanks to dabrownman and if it works I will try this bake again with yeast water. If there is a loaf that suggests, "Tear me apart and eat me!" this is the one! Wow! I just want to grab and pull on it till I have a chunk. ...with melted cheese sounds good, Sylvia! Fondue? I got two starters raring to go this morning... a wheat and a rye. It's a cool crisp day (-4°C) and all the leaves have bespeckled everything. Fresh chestnuts waiting to roast near the end of the bake. Your beautiful loaf reminds me of roasted chestnuts too! Roasted pumpkin, LOL! Many thanks for your kind and amusing comments! The cool fall weather is a great time to bake. I am just hoping the snow we got Sunday melts so I can rake up the rest of the leaves . . . Speaking of roasted pumpkin I recdntly made a batch of carrot and squash soup - you could use pumkin too. But instead of roasting the veggies, I put them in the smoker with applewood and that little kiss of smoke -- oh my!